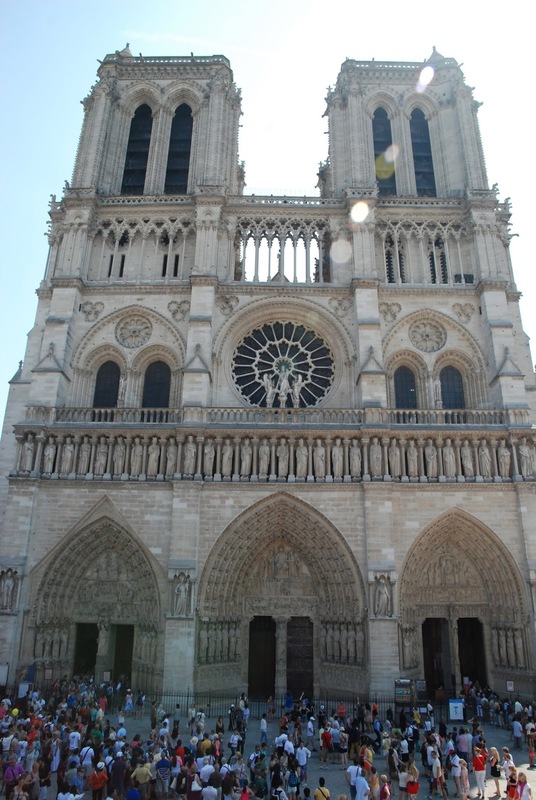 Notre Dame has been in existence in some form for 850 years and it is still in use. Your Ramblers got in the visitor line, but many folks got in the mass line. 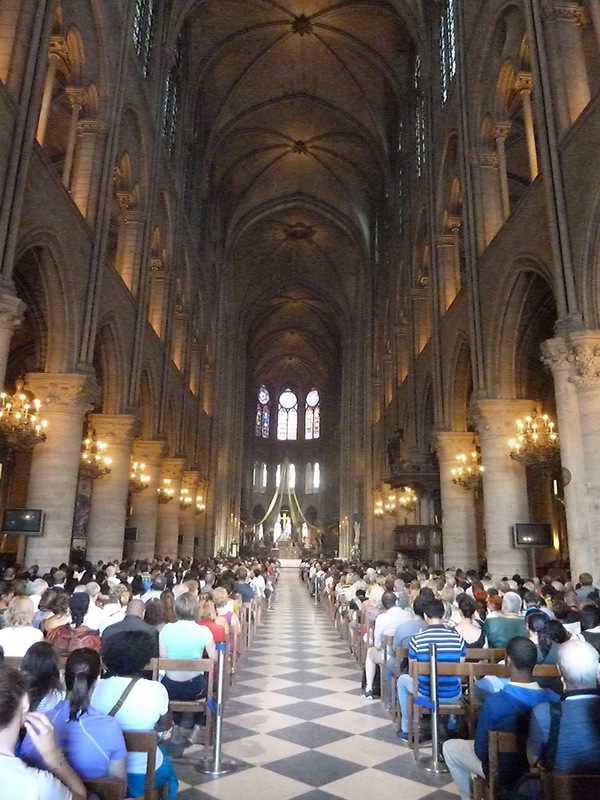 Since it was Sunday, morning mass was being held even while several hundred visitors circled the outer ring inside the cathedral. The cathedral is an amazing spectacle for the sheer engineering ingenuity and effort it took to build something like that over 800 years ago. It is also steeped in history as one can imagine and walking through you can almost feel the intrigue, majesty, charity and horror that has taken place here. Your Ramblers decided to skip the upper tower tour because of the line, it was really getting hot, and with Le Tour finishing late in the evening it was going to be a long day. We sought out some shade and refreshment (and a bathroom as well) and found it in a nearby café. A shady spot on the corner was ideal for a plate of sausages and frites with a small carafe of wine to serve as lunch. Our bellies full, we decided to reconnoiter the route Le Tour was taking in Paris and see if any good spots were available. We found several, but since it was still six or seven hours before the riders would appear (and Rambler Rule #1 is short lines and don’t sit in the heat for a really long time) we had to take note and keep moving. The course was already beginning to get early viewers staking out their spots. The Norwegians had a premo spot just outside the Louvre. Here is Rambler Jane amongst the throng. Rambler Hance found a really great spot (at least better than anything except the finish, which was grandstanded up for VIPs and officials) at the 1 KM to go mark. He explained to Rambler Jane the racing at that point would be intense on the final lap. Rambler Jane seemed less than impressed. C’est la vie. After wandering in the general area for a while longer we set off for a Metro station to catch the train back to the hotel to take a rest. The Paris Metro is actually cool (temp not cachet). The cars are all open from the front of the train to the rear and they are connected with flexible joints that when moving make the train resemble a snake but it allows a lot of airflow through the train. Anyone that has been on the NYC subway in hot weather knows that is not how the system works there. The A/C in the hotel room felt wonderful and we settled in for a little blogging and a power nap. continued to grow and by this point was three to five bodies deep as far along the course as we could see, which means the whole 5-6K loop inside Paris must have been this way. Our spot staked out was next to some entertaining young Brits with three plastic shopping bags full of beer from McDonalds, and there we watched the caravan arrive and dance and wave and do a full on 3D advertising spectacle. The crowd continued to grow and now was five to seven deep but strangely peaceful. The last stage of Le Tour is a sporting oddity. Neither the final day’s race nor the overall race are really contested until the final lap when the sprinters go at it. It is more a parade celebrating the end of three weeks of physical effort for the riders. The presumed winner (presumed unless he dies on the course or has such a bad wreck he can’t pedal the rest of the way home) rides in yellow and drinks champagne on his bike with his team and managers and the peloton casually cruises through the French countryside, then parades into Paris with the team of the yellow jersey leading the whole peloton into Paris for one lap around the Paris course. All this cycling description is a long way to say the crowd knows how this ends and other than a little sprint excitement the whole day is really just a celebration of cycling, of your countrymen on whatever team and sort of a festival with closed off streets. By the time the riders come into town and start traversing the looped circuit in earnest the crowd in total is probably a million people give or take. It becomes difficult to see other than the big video boards deployed along the course and even those can be difficult to see over the heads of the tall, kids and girl friends on shoulders of others etc. If you really want to see the cycling – watch TV. As the tour came to and end it was close to 10pm and we retreated to the hotel room to watch the awards ceremony and the light show, which was great. We were bushed and went to bed knowing we were headed for home tomorrow. Hello--Rambler Jane here. I would like to add a few details from my perspective regarding our quest for a good spot to view the Tour riders. We went to Rue de Rivoli to scope out a spot (the place where Rambler Hance pointed out that the straightaway and 1km point would be an excellent place to be). We were on the south side of the street where there was a wall that was the boundary of the Tuilleries gardens and we probably would not have had the issue with people crowding in at the last second. However, we were not prepared to camp out there at that point (it was hot, no food or water and few/questionable bathroom options)and it was still several hours before the event. We started walking toward the hotel to see if we found any equally good spots but then realized that we were trapped on the wrong side of the street where we were because the streets had already been blocked off (a little like being stuck in the infield at a NASCAR race). So, we were forced to take the Metro to get out of that area and continue planning from the hotel. In hindsight, I wish I had thought to let Rambler Hance claim a spot on Rivoli while I left to procure food and water and return with it, but there would have still been the issue of limited facilities on that side of the street. It was most certainly one of those situations that you learn the first time how to prepare if there is ever a next time. C'est la vie!